Even in a city as ethnically diverse as Miami, few Jews and Muslims have the opportunity to talk to one another. Now, an innovative program by Florida International University seeks to bridge the gap between them and create new avenues of engagement. FIU’s recently launched Jewish Studies Initiatives this fall will present a three-program series on Muslim-Jewish Relations, ranging from provocative discussions to celebrating music and culture. Free of charge and open to the public, the series will be held at the Jewish Museum of Florida-FIU, 301 Washington Ave., Miami Beach. 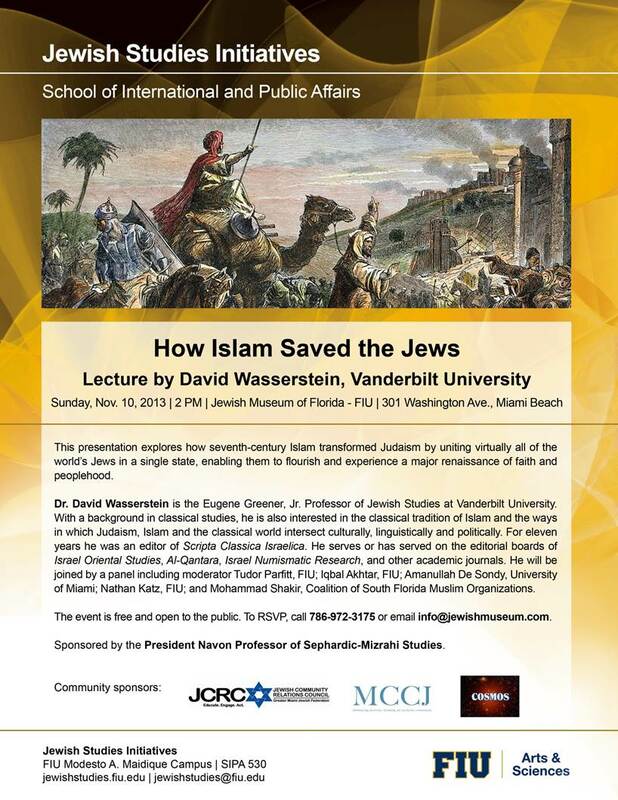 Kicking off the series Sunday, Nov. 10 at 2 p.m. will be a panel discussion on “How Islam Saved the Jews.” Guest speaker David Wasserstein, a professor of history, classics and Jewish Studies at Vanderbilt University, will explore how seventh-century Islam transformed Judaism by uniting virtually all of the world’s Jews in a single state, enabling them to flourish and experience a major renaissance of faith and peoplehood. Moderating the discussion will be Tudor Parfitt from FIU, with panelists Iqbal Akhtar and Nathan Katz both from FIU, Amanullah De Sondy from the University of Miami, and Mohammad Shakir from the Coalition of South Florida Muslim Organizations. The program is sponsored by the President Navon Professor of Sephardi-Mizrahi Studies. “The Shoah through Muslim Eyes” will be the topic of the Annual Holocaust Studies Lecture on Thursday, Nov. 21 at 7 p.m. Featured speaker will be Mehnaz Mona Afridi, a Pakistan-born Muslim woman who is director of the Holocaust, Genocide and Interfaith Education Center at Manhattan College in New York. Afridi’s talk, also the title of her soon-to-be-published book, touches on the speaker’s “struggle with anti-Semitism within the Muslim community, (and) its lack of education (about and subsequent) denial of the Holocaust,” she said in an interview with The Jewish Week. While Afridi focuses on educating Muslims about the Holocaust, she said she also strives to “shed light on important, little-known Muslim narratives to show the connections between Muslims and Jews” during that dark period in history. The program is sponsored by the Ruth K. and Shepard Broad Distinguished Lecture Series. Capping the series on Tuesday, Dec. 3 at 6 p.m. will be a program of Sufi Poetry and Music, presented by New York-based actor Peter Rogen and Alan Amir Vahab, a leading Turkish singer and musician. Sufism is a mystical dimension of Islam. Vaheb and Rogen will feature poets Rumi and Hafeez, two of the great figures in world spirituality, both emphasizing interfaith harmony and unity of the Divine. The program is sponsored by FIU’s Program in the Study of Spirituality. Community sponsors of FIU’s Muslim-Jewish Relations Program Series are the Coalition of South Florida Muslim Organizations, the Jewish Community Relations Council of the Greater Miami Jewish Federation, and MCCJ, known historically as the Miami Coalition of Christians and Jews. For more information, contact jewishstudies@fiu.edu or 305.348.2186.